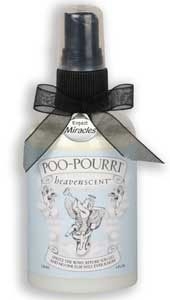 Poo-Pourri is a liquid that you shake and spray directly onto the surface of the water in your toilet bowl. The all-natural essential oil formula creates a film on the surface, effectively encapsulating any waste matter and trapping embarrassing odors. Once the business is done, flushing releases the odor-neutralizing scent of Lemongrass, Grapefruit and Bergamot into the air, leaving the bathroom citrus-fresh! Unlike most bathroom spray deodorizers that try to mask the stinky poop smell after it is in the air, Poo-Pourri is designed to be sprayed directly onto the toilet bowl water before you go! Poo-Pourri toilet deodorizer does more than just improve air quality- it is environmentally friendly. Our secret blends rely on essential oils to eliminate bathroom odors making it safe for the planet and your septic. The motto says it all: "Spritz the bowl before you go, and noone else will ever know!" Poo-Pourri bathroom spray deodorizer does more than eliminate bathroom odors - it is forever changing the bathroom experience. And you will not believe how great it works! Absolutely amazing! Spritz the bowl before you go and no one else will ever know! Poo~Pourri Original 2oz Bottle - Stop embarrassing odor with our Patent Pending bathroom freshener. Our Natural Essential Oils create a film on the surface of the water, trapping odor at it's source. A Citrus Fresh blend of Lemongrass, Bergamot, Grapefruit and other natural essential oils that leave the bathroom smelling clean and fresh! The 2oz bottle is the perfect size for your purse or briefcase! It's ECONOMICAL-with up to 100 uses, it's less than 8 cents per use! Spritz the bowl before you go and no one else will ever know! Poo~Pourri Original 4oz Bottle – Stop embarrassing odor with our Patent Pending bathroom freshener. Our Natural Essential Oils create a film on the surface of the water, trapping odor at it's source. A Citrus Fresh blend of Lemongrass, Bergamot, Grapefruit and other natural essential oils that leave the bathroom smelling clean and fresh! This size makes a great "show item" for your bathroom. It's ECONOMICAL - with up to 200 uses. Great washroom scents for all distinguished gents! Royal Flush 2oz Bottle - Stop embarrassing odor with our patent pending bathroom freshener. Our natural essential oils create a film on the surface of the water, trapping odor at it's source. The fresh essence of Eucalyptus works in synergy with Spearmint in this perfect scent for both men and women! You get about 100 uses out of this 2oz bottle. Great Washroom Scents for all distinguished gents! Royal Flush 4oz Bottle - Stop embarrassing odor with our patent pending bathroom freshener. Our natural essential oils create a film on the surface of the water, trapping odor at its source. The fresh essence of Eucalyptus works in synergy with Spearmint in this perfect scent for both men and women! 4 ounces up to 200 uses! A sleek and sophisticated way to travel with your Poo~Pourri scent of choice. 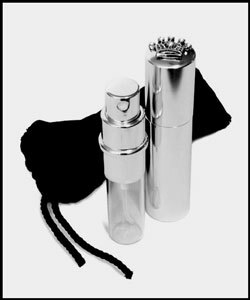 This Atomizer gift set comes with a refillable purse size atomizer and a velvet carrying case. Holds a third of an ounce of product. Filled with either Original Scent or Royal Flush -- your choice.